There are plenty of folk and Viking-inspired Northern European metal acts out there, but (and this includes my favorites) it's impossible for them to be truly authentic, for the simple reason that blastbeats, electric guitars, and synths were kind of hard to find in ancient Scandinavia. For true authenticity in the field of ancient pagan music, instead of living somewhere in a major city where you could get gigs, it might be better to get rid of your distortion pedals, live out in some cabin in eastern Sweden, and spend a bunch of your time communing with nature, studying runes, and worshipping the Norse gods...right? Apparently, H.L.H. Swärd's musical and scholastic interests have led him on just such a path. 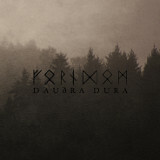 Formerly in a metal band but inspired by an experience at the Arosian Black Mass metalfest, he started Forndom with a combination of some beautiful photography, painting...and folk-inspired ambient music, the latest of which appears on his new album, Dauðra Dura. The songs are soft and filled with chanted vocals, but exquisitely produced, with the same hushed atmosphere to them as the chanting of monks in a Catholic or Orthodox church. And that shouldn't come as a surprise; after all, this, too, is a type of religious music. Most of the instruments, as mentioned, are traditional, with echoing drums, acoustic guitars, and somber, scraping violins of the sort that Eluvetie did a lot of on their earlier albums. Some horns make an appearance on the more abrupt tracks such as När Gudarna Kalla, my favorite track, followed by deep Viking-warrior-like chants, but they're used more for effect. The really ubiquitous instrument on almost every track is a droning background hum that I take to be a synth of some kind, giving a poised effect to the music as if waiting for some momentous event to happen. In a metal song that would probably be an electric guitar intro, but here it is usually violin. With so little happening melodically, the drums have a greater prominence that Swärd uses to good effect, and I can't help but wish there was more of that than the "Hey, yah yah" chants that appear on I Hel's Sköte; the lead vocals, when they do show up, are somewhat of a welcome relief. The parts where the Forndom sound really shines is where he changes up the sound a bit, such as on the dim, grey-sounding Den Grymma Hästen, where we get to hear acoustic guitar picking and chanting with some lyrics in them. While anyone who's in the mood for loud music should definitely ignore this one, it's beautiful and well-made, much like Swärd's art and photos, and worth giving a listen to.